Being the knowledgeable naturalist that he is, Bruce has given us the answers…enjoy! Why is an evergreen, ever green? Tryon Creek State Natural Area supports an abundance of evergreens. Perhaps the most impressive are the massive Douglas-fir (Pseudotsuga menziesii) trees. 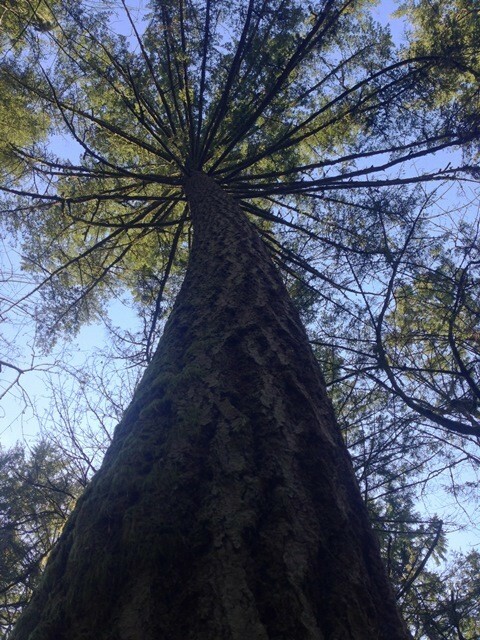 On a recent nature hike, an adult hiker asked me if it was true that Douglas-firs never lose their needles. Actually, Douglas-firs do lose their needles; it is just that they do it on a different schedule from the broadleaved trees like maple and alder. To show how this works, I picked up the Douglas-fir branch in the photo below at Tryon Creek SNA after a windstorm. I cut off all the side branches to make it easier to see the needle retention pattern on this main branch. The orange ribbons mark the places on the branch where one year’s growth stops and the next year’s growth starts. Thus, in this picture, you can see branch segments that grew out in 6 consecutive years. The oldest part of the branch is on the right. Check out the pattern of the needles. Okay, first things first; how can you tell the different year’s of branch growth? On relatively young branches (up to about 5 years old) of many trees, it is easy to see the point at which one-year’s growth stopped and the next year’s growth started. Check out the ring around the branch below, it’s marking the end of one year’s shoot growth and the start of the next year’s. These rings are eventually obscured as the branch becomes thicker. In addition, a standard ring count on the cut end of a branch works too (I counted this branch myself, 6 rings = 6 years). Look for the ring near the center of the branch. The youngest segment of the branch we find at the end, showing off its spiral brush of needles. All the needles were originally formed this past summer and are still present. At the tip of the branch, you can see the grayish-purple pointed bud that was scheduled to elongate next spring to produce the next year’s branch segment. One year old branch segment. This branch segment shown below, has all of the needles originally formed and they are still on the branch. The two year old, the needles are still hanging on. On the branch segment below, almost all of the original needles have persisted on the tree, both on the upper and lower sides of the branch. However, a small number of needles have been lost. The three year old begins to lose its needles. 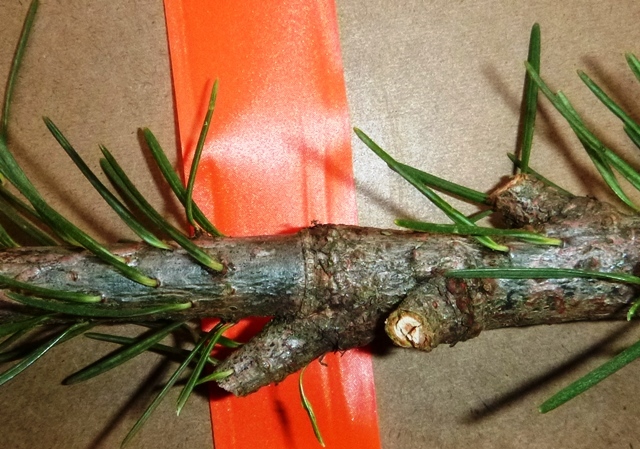 Check out this branch segment below, many of the needles on the upper side of the branch have persisted, while only a few of the needles on the lower side of the branch (the bottom of the picture), still remain. The four year old is really starting to lose it. The five year old, nearly bald on the bottom. The six year old, left needle-less. It means that a plant always has some green leaves or needles, because the leaves or needles persist for more than just one growing season. I’ve examined several branches of Douglas-fir that have been blown down this past year at Tryon Creek. Having needles up to 5 years old on a branch seems to be pretty typical, although I’m sure there are some exceptions. On your next trip to Tryon Creek, see how many evergreen plants you can find. 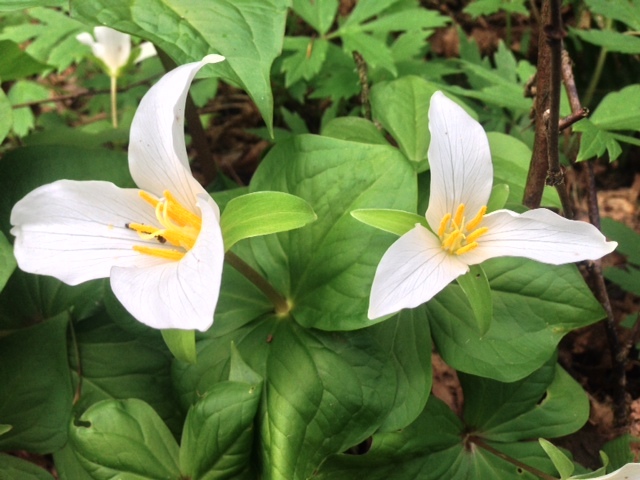 Spring is near and we are ready to welcome it with our Annual Trillium Festival! Each year the Friends of Tryon Creek and Oregon Parks and Recreation Department are thrilled to share the beauty of our awakening forest with visitors as they enjoy this wonderful community event. Visitors may enjoy our native and hardy plant sale, guided nature hikes, nature discovery openhouse and exhibits, local craft and garden art vendors, and native gardening and nature presentations at the only all-urban state park in Oregon! This exciting event supports the education and restoration programs of the Friends of Tryon Creek State Park, and is a great place to find all the native plants you’ll need for your yard this Spring. Hope we’ll see you there!